Community colleges are at the frontlines of education in America. That's the message Dr. Jill Biden and I have been taking across the country this week on our "Community College to Careers" bus tour. It's also a message that is especially important to the Latino community. So many Latinos rely on community colleges to pursue their dreams. Roughly half of college-going Latinos are enrolled in community colleges. And most of our Hispanic-Serving Institutions are community colleges. As Latinos are the fastest growing minority in the U.S., it's critical that we invest in the institutions that are building up this skilled workforce in America. Dr. Jill Biden and Secretary Solis exit the Community College to Career (CC2C) bus with smiles. The first elected office I ever held was as a trustee on the Rio Hondo Community College Board in California. So I know well the value these colleges have for Latinos. In so many ways, they're a perfect fit. Community colleges are local and flexible. They provide accelerated and translatable degree programs. And they provide training that sets people up for jobs in their community -- all at very low costs. If we are serious about meeting the challenges of the 21st century global economy, and if the promise of fair access to higher education is to be realized, then it's going to happen at community colleges. That's exactly what Dr. Biden and I have been hearing on this bus tour through Ohio, Kentucky, Tennessee and Virginia. Workers are telling us how important community colleges have been not only to them, but also to their communities. Employers are telling us about this, too. In fact, a big reason for our bus tour is to see how businesses are partnering with community colleges to create innovative job training programs. The idea is simple: community colleges will partner with businesses to develop training programs that match the needs of local job-creators. 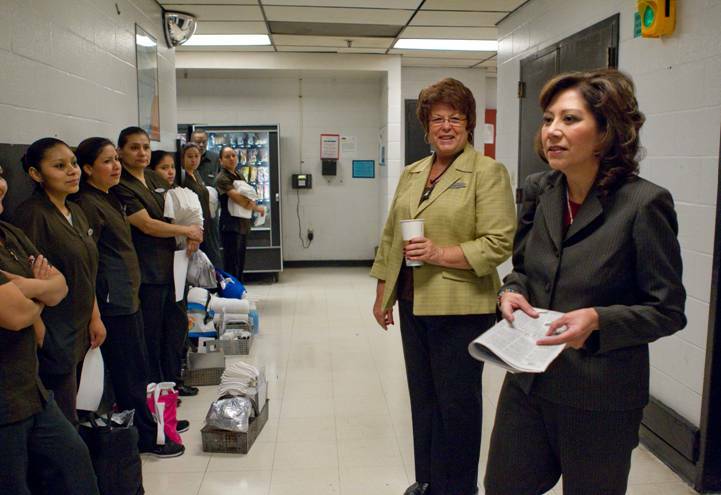 Secretary Solis stops to speak with members of the hotel staff about opportunities at local community colleges before starting the second day of the CC2C Tour. We know that these partnerships are critical to ensuring American workers, and businesses, succeed in the future. That's why President Obama has made them an important centerpiece of his newest initiative to invest in American workers. It's called the Community College to Career Fund. This $8 billion fund is designed to help workers obtain the skills they need to get job offers in industries that are hiring right now. Providing workers with the latest certified training and skills for jobs in high-growth and in-demand industries. This last point is particularly important for Latinos. As a community, we are sorely underrepresented in science, technology, engineering and math (STEM). Take engineering for example. Less than 7 percent of American engineers are Latino. But over the next decade, there will be 1 million new U.S. job openings in STEM. And college students who study these fields will make a half-million dollars more over their lifetimes than other students. As a community, it's imperative that we encourage our young Latinos to consider careers in STEM. That's why President Obama wants to invest $100 million to improve college education in these fields -- with a special focus on community colleges and minority-serving institutions that train many Latinos. And it's why the president is pushing for the creation of more clean energy jobs -- and for the skills training to match them. America's future will only be as strong as the industries we create and grow, and that means we must support our entrepreneurs, our workers and the institutions that train them. By making this commitment to education and meaningful skills training for Latinos, we can educate our community, open new career pathways, restore our prosperity and create an America that's truly built to last.